When I was growing up in Ireland, my mother made soda bread almost every day. But it was not the sweet raisin-and-caraway-filled loaf many Americans call Irish soda bread. A real soda bread is a simple loaf with a beautifully browned, craggy crust and a nice chew, best eaten liberally smeared with salty Irish butter. 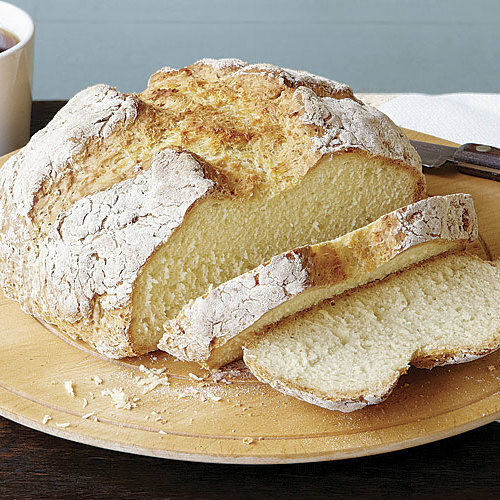 Soda bread has been an Irish household staple since baking soda became commercially available in the early 19th century. It uses only a few ingredients that most people kept on hand—flour, salt, baking soda, and buttermilk from the “sour milk jug” every house had before the advent of refrigerators. It also didn’t require an oven; it could be baked in a bastible, a type of cast-iron Dutch oven, suspended over an open turf fire. Hot embers were placed on the lid so the heat came from both the top and underneath. 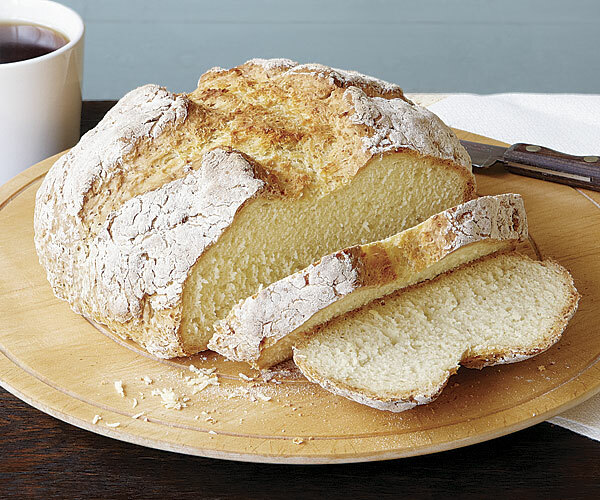 But now that we have ovens and refrigerators, this bread has gotten so easy to make that you, too, might find yourself baking fresh soda bread almost every day. Turn on the oven before you measure the ingredients. It should be fully heated by the time the bread is ready to bake because the acid from the buttermilk starts reacting with the baking soda as soon as they mix, creating little air bubbles that need the heat of the oven to expand and make the bread rise. Use your hand to mix the dough. 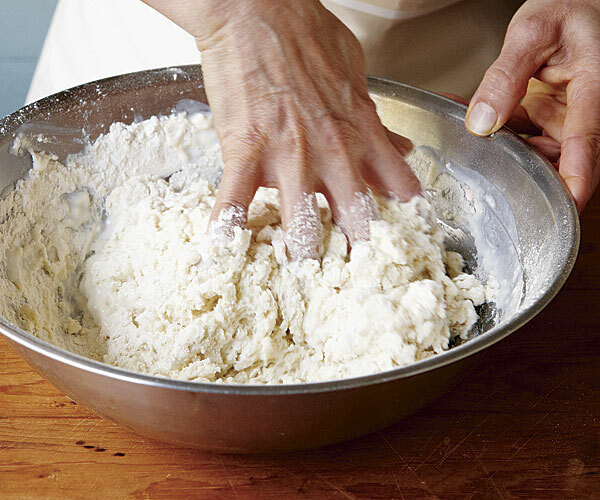 Spread your fingers, as shown above, and mix in a circular motion to keep the dough light and airy. Forgo kneading. It will make the bread tough. 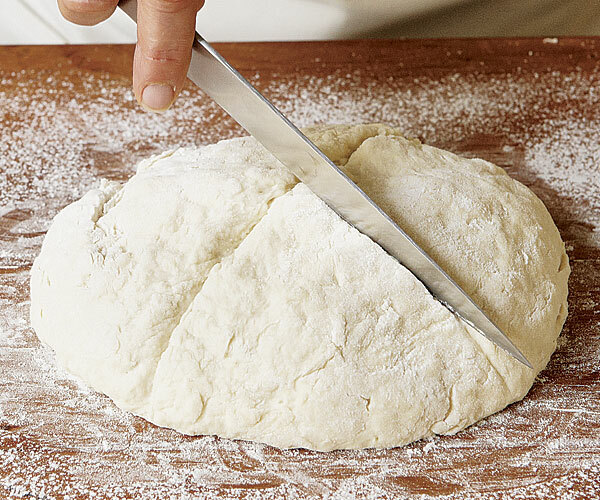 Simply turn the dough out onto a floured surface, shape it into a round, and transfer it to the baking sheet. Make the round of dough no thicker than 1-1/2 inches in the center. A thicker loaf will get spongy inside and won’t rise as much. Try a softer crust. A good, pronounced crust is part of soda bread’s appeal, but you can wrap the bread in a clean dishtowel while it cools to make the crust more tender and pleasantly chewy. Mark the bread with a cross before baking. This opens the crust so the heat can penetrate the center of the loaf. Irish folklore holds that this is also done to let the fairies out.